Hi everyone! Today is the third day of the My Favorite Things May release countdown. This release is packed with amazing new products! The new products will officially be available on the MFT online store on May 5th at 10pm EST. 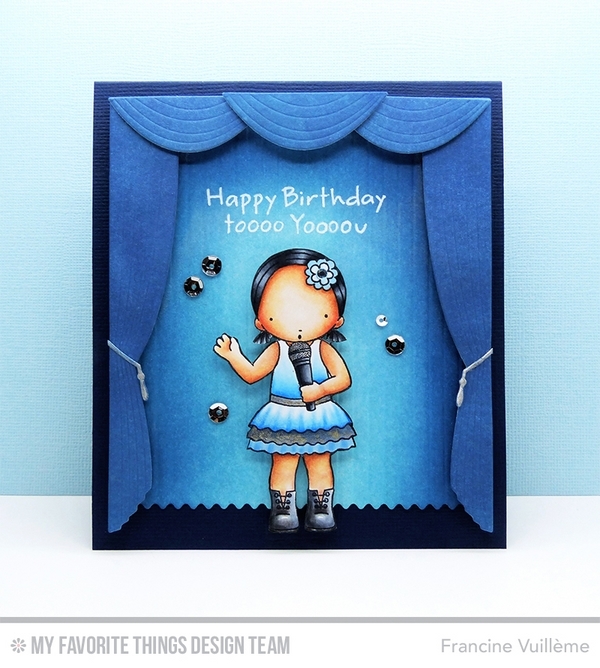 For this card, I also used the new Take the Stage Die-namics. I chose blue shades and colored the image with Copic markers. I die-cut the stage from white paper, then sponged it with inks to create more depth. I stamped the birthday sentiment with white pigment ink. For today’s full product reveal, links to other awesome projects from the MFT design team and giveaways, be sure to check out the MFT blog! Thanks so much for visiting my blog and see you soon for more countdown fun! Oh my gosh, stunning and genius Francine. Très beau travail Francine ! Ta carte est superbe ! Love the blue colour you used Francine! Great card. this card in blue tones looks amazing! Love how she has her own stage. Wow! Gorgeous coloring...love the blue! And, the adorable PI image is super cute on stage! OOh, I love the shades of blue. sooo darn cute!!!!! Love it!! Great job, Love the new stamps and dies. Thanks for sharing. nobody else recognize such designated approximately my problem.